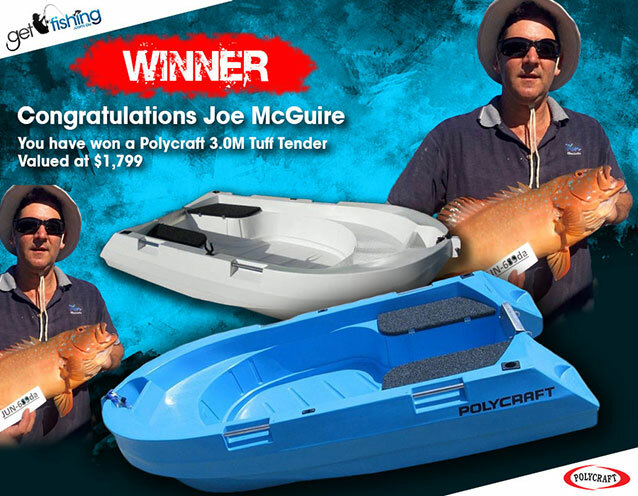 Congratulations Joe McGuire from Gladstone QLD, the winner of our second Polycraft Tuff Tender boat giveaway. Joe’s name was drawn from over 800 fishing tournament entries between March and June 2016. Joe has been rewarded for his luck with a brand new Polycraft 3.0m Tuff Tender boat worth $1799. Joe’s winning fish was his 61cm Coral Trout submitted in June 2016. Just like Anthony Sluggett’s winning fish last time, this was the only fish Joe submitted during the 4 month competition window from March to June so he definitely had luck on his side! Joe has only been a tournament member for a couple of months and it’s great to see him getting amongst it. We are sure he’s going to love his new boat to cruise around the rivers and creeks near Gladstone and no doubt he’ll be landing some nice fish in it very soon. Once again, congratulations to Joe on his win. We would like to take this opportunity to extend a big thank you to all of our members that competed by submitting tournament entries during the campaign. We look forward to drawing the next Tuff Tender in early November for the July-October competition period. For more information on how to enter click here.